Now that it’s officially spring, it’s time to introduce our next travel plan. On Friday, April 3, we take off for Miami, the Florida Keys and Grand Cayman Island. A friend’s recent move to Georgetown, Grand Cayman was the original inspiration, but we figured as long as we’re going that direction, we might as well throw a few national parks into the itinerary, right? So our trip will begin by flying into Miami and spending two nights in the Art Deco District in South Beach. Normally we would use Hotwire to book lodging in a major city, but an Orbitz coupon proved to be the better deal and we made reservations at the Clay Hotel. It’s in the perfect location for exploring Miami Beach and is easily accessible from the airport via the Miami Beach Airport Flyer bus route. Tip: Always check public transportation options from airport to city as we’ve found car rental rates to be much higher when picking up from an airport location as opposed to a central city office. Also, we won’t need a car that first evening, so it saves us a day’s rental fee. The following morning we’ve reserved a car in Miami Beach and we’ll drive west and spend the day visiting Everglades National Park. The Flamingo Visitor center on the Gulf Coast is just a two-hour drive from Miami and other areas of the park are even closer. Everglades National Park protects a fragile ecosystem of wetlands and forests fed by a slow moving river flowing from Lake Okechobee to Florida Bay. It has an amazing diversity of plant and animal life and is an International Biosphere Reserve, World Heritage Site and a Wetland of International Importance. Major activities include hiking and biking as well as the expected boat tours and wildlife watching. We’ve reserved a backcountry pontoon boat tour but will play the rest by ear. Back in Miami Beach for the evening, we’re looking forward to partaking in the restaurant and bar scene around town. We haven’t decided just where we’ll go yet, but our options look promising. The next day will be spent leisurely making our way down the Florida Keys. Biscayne National Park is located just south of Miami, but disappointingly has no current vendor to offer tours or rentals, so our stop will mostly be limited to the visitor center and shore. Since 95% of the park lies underwater, that’s a major buzzkill. Hopefully they’ll get the issue resolved soon. Key West is 140 miles from Biscayne National Park, and we’ll spend the rest of our day making our way there by way of the Overseas Highway and its 42 bridges. On the way we’ll make stops at state parks and the National Key Deer Refuge on Big Pine Key. Fort Jefferson at Dry Tortugas National Park. Finding affordable lodging in Key West was one of the biggest challenges in planning this trip. April is their high season so rates are at their peak. We stumbled upon NYAH (Not Your Average Hotel) on TripAdvisor and found the rates to be reasonable, the location great and the facilities new and clean. We’ll spend the next three nights there’s exploring the wonders and weirdness of Key West. One day will be spent on a full-day visit to Dry Tortugas National Park. This is one of the most difficult of all the national parks to get to as it is located 70 miles directly west of Key West in open ocean; the only way to get there is by boat or seaplane. 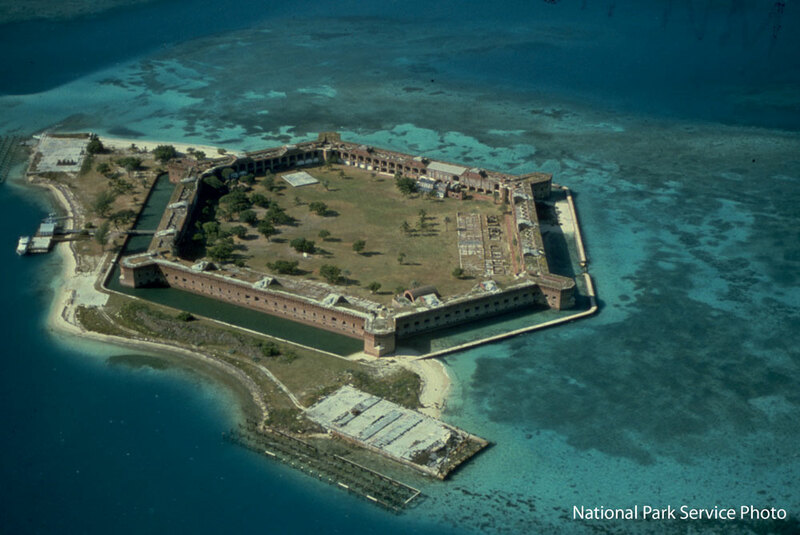 It contains the historic Fort Jefferson, some small, uninhabited keys and lots of underwater wildlife habitat. We pre-booked our travel through drytortugas.com on board the Yankee Freedom III. It takes 2.5 hours to reach Fort Jefferson. Upon arrival there is a fort tour, lunch and complimentary snorkeling equipment provided. After about 5 hours at the park it’s time to board the boat and head back to Key West in time for dinner. Adventurous types can stay behind and camp overnight on the beach, but that seems a bit extreme. The next portion of the trip is a flight from Key West to the British Overseas Territory of the Cayman Islands. We’ll spend 4 nights in George Town, Grand Cayman with a lucky friend who recently relocated there for work. If you want friends to visit, move to a tropical island. The Islands are probably best known as a tourism destination, with pristine beaches, snorkeling, boat trips and beachside resorts and bars. Secondly it is known for being one of the world’s largest offshore financial centers and a major tax haven. It is the world’s fifth largest banking center, despite having a population of only around 60,000. The Cayman Islands have been affected by more tropical storms and hurricanes than any other place in the Atlantic basin, but weather in April should be ideal. High temperatures are consistently in the mid-80s throughout the year and early spring months are the driest. So far we’ve planned (with some local help) a sunset cruise along 7 mile beach, a daylong party boat cruise (happy birthday), a historical island tour, an evening bioluminescence kayak tour (the stuff in the water glows in the dark), and a four-course, four-restaurant “flavor tour” dinner. Obviously there will be significant time allotted to laying on the beach, because every once in a while we like to relax too. This trip will add three national parks to our visited list, bringing the total to 31. Keep an eye on our page while we travel April 3-12. This entry was posted in Destinations, Upcoming Travel and tagged Art Deco District, Biscayne National Park, Clay Hotel Miami Beach, Dry Tortugas National Park, Everglades National Park, Florida Keys Road Trip, Grand Cayman Vacation, Miami Beach Spring Break, NYAH Key West. Bookmark the permalink. Hi I’m going to Biscayne NP and ENP in May, that’s how I stumbled on your blog. I’m booking accompany that is allowed by permit to take us snorkeling in Biscayne NP! http://www.miamioceanrafting.com it’s 300$ for two of us, from miami beach area to the NP waters and a trip to Boca Chita Key. Well worth it IMO. Just wish I could fit Dry Tortugas too!! Great tip! Unfortunately we won’t have time to squeeze this in, but it’s good to know.